The pharmaceutical & medical industry face unique challenges in complying with environmental pollution and emission control regulations. There are many complexities in the manufacturing of synthesized pharmaceutical products. Each plant is unique, differing from other plants in size, types of products manufactured, amounts and types of VOC used, and air pollution control problems encountered. Production methods used in the manufacture of pharmaceutical products include both batch and continuous operations, although batch operations make up a majority of the processes. Emissions consist almost entirely of organic solvents including a range of volatile organic compounds (VOCs) and several Hazardous Air Pollutants (HAP) that escape from dryers, reactors, distillation systems, storage tanks, and other operations. In a typical batch process, solid reactants and solvent are charged to a reactor where they are held (and usually heated) until the desired product is formed. The solvent is distilled off, and the crude residue may be treated several times with additional solvents to purify it. The purified material is separated from the remaining solvent by centrifuge and finally is dried to remove the last traces of solvent. Tablet coatings, aqueous or solvent based, may also be applied for taste and odor masking, physical and chemical protection, or controlled time release. These batch processes can involve a range of varying exhaust volumes and VOC concentrations including ultra-high LEL (high concentration of VOCs), corrosive acids produced in the process off-gas and the post-combustion gases, and high air volumes and lower VOC concentrations. Catalytic and thermal oxidation are the most widely accepted control technologies for destroying the VOC emissions from pharmaceutical operations. 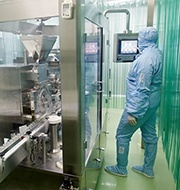 Pharmaceutical operations, however, face many challenges and typically require specially designed emission control systems to address various challenges such as high VOC concentrations, corrosive acids produced in the process off-gas and post-combustion gases, or high air volumes and lower VOC concentrations. A pharmaceutical process including multiple fluidized bed granular dryers and tablet coating stations required a control system designed to work within a range of varying exhaust volumes and high VOC loads, provide low operating cost, and include a heat recovery solution. Each process exhausts a high concentration of methanol, acetone, and alcohol based VOCs. The lower explosive limit (LEL, sometimes referred to as lower flammable limit) from the process is expected to be approximately 40 percent LEL. This is considered a high LEL and requires certain expertise and equipment design features to safely handle the process exhaust stream. In this application, the pharmaceutical plant had many processes that contribute a range of VOC loadings to the oxidizer. To provide production flexibility, the oxidizer needed to be designed to accept any level of exhaust volume and VOC loading on a moment's notice. The solution was to evaluate the process and engineer a long-term, highly reliable VOC abatement system. 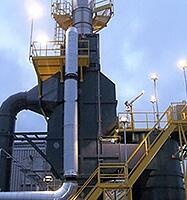 During the evaluation phase, substantial natural gas was discovered being used in the plant's boiler system. 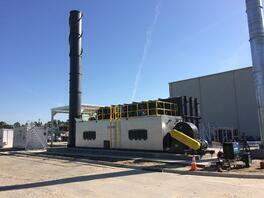 The decision was made to use a catalytic oxidizer to provide VOC abatement. Catalytic oxidizers are capable of processing substantially higher VOC loads than regenerative thermal oxidizers and, more importantly, can provide a constant VOC removal efficiency greater than 99 percent, no matter what concentration is delivered to the oxidizer. This solution also incorporates a primary heat exchanger that reclaims heat created in the oxidation process as a means to lower natural gas cost. A pharmaceutical manufacturer was given the challenge of designing a system that was able to process the ultra-high LEL (high concentration of VOCs) and deal with corrosive acids produced in the process off-gas and the post-combustion gases. Many processes use halogenated VOCs. A halogenated VOC is an organic hydrocarbon that contains chlorine (Cl). The combustion reaction produces post-combustion gases that will contain Hydrogen Chloride (HCl). Even low concentrations of HCl are corrosive, and special engineering has to be considered in the design, material selection, and auxiliary equipment to provide a long-lasting system. To meet the needs of local regulations and the Maximum Achievable Control Technology (MACT) standards, HCl also must be removed from the exhaust stream before release to the atmosphere. The halogen VOCs this system is designed to destroy are corrosive and require the use of a unique combination of alloys that address corrosive resistance, structural stability, and high temperatures. The issue of scrubbing the acid gases out of the exhaust stream also had to be evaluated. 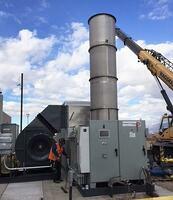 To meet the high VOC-removal rates for halogenated VOCs, an oxidizer needs to operate at 1,500°F. But a scrubber cannot directly accept air temperatures greater than 300°F. Therefore, a quencher is used to cool the gases after the combustion chamber and before being introduced to the scrubber. A quencher works by using water mist to cool and saturate the hot exhaust before entering the scrubber system. Once cooled, the acid-containing exhaust stream is directed to a counter-crossflow scrubber. The acidic gases are directed into the bottom of the scrubber for eventual release through the top of the scrubber. A caustic solution, typically a 25 percent solution of sodium hydroxide (NaOH) is used as an acid neutralizer. This chemical reaction "scrubs" the acid from the exhaust stream for safe release to atmosphere. The combination of a thermal oxidizer with a quencher and scrubber resulted in more than 99.9 percent removal of all VOCs and HAPs entering the system and greater than 99.9 percent removal of HCl gases. Pharmaceutical manufacturers routinely operate their production in batch operations. In some cases, several processing steps are required (such as mixing followed by drying, followed by granulation, followed by post-drying, followed by cooling). In such cases, a single batch processor is often less expensive and easier to operate than a continuous processor having multiple processing zones. Some steps in batch operations may include agglomeration and granulation. This involves spraying a fine mist of binder solution onto the product. Another step in the operation may involve coating. Coatings may be used to provide a controlled dissolution rate (timed release), or to add a surface agent needed for downstream processing. Depending on the products being manufactured, part of the process can include solvents including alcohol-based solvents, ethanol and methanol. As a result of the numerous steps in a batch process, some batch operators may have higher air volumes and lower VOC concentrations. One such pharmaceutical manufacturer's plant required a VOC abatement device that could operate throughout a range of batch operations, provide consistently high VOC removal efficiency, and produce very low levels of nitrogen oxides (NOx). A Regenerative Thermal Oxidizer (RTO) was selected as the best technology for the abatement of VOCs from the batch operations. In addition, the use of a VOC polishing chamber was included to provides an added step in lowering final emissions to the atmosphere. Sometimes called a puff chamber, the system captures the small volume of untreated gases that result from the switching of the valves in the RTO. The chamber stores and recirculates the VOCs for increased destruction efficiency. Natural gas injection (NGI) was added to eliminate NOx and lower natural gas costs. The use of NGI is a technique used to raise the concentration of the incoming exhaust gas high enough so that the natural gas burner can be turned off. By eliminating combustion of natural gas in the burner, thermal NOx is eliminated and the system operates safely without formation of NOx. 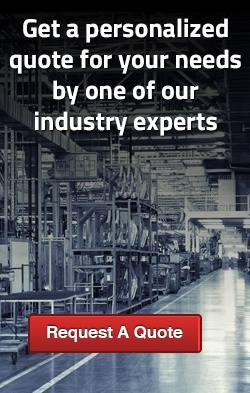 NGI is a proven technique that helps lower operating costs and eliminate NO emissions. However, it requires certain design considerations to gain necessary approvals and to operate in a safe and reliable manner.